If you are wondering how to convert horsepower to watts or watts to calories, this power converter is a tool for you. Change quickly between twenty different power units by typing one value into the calculator. If you are curious about power conversion factors, BTU to watts conversion or you just want to know what a watt actually is, keep scrolling and you'll find the answer. If object's velocity is held constant at one meter per second against a constant opposing force of one newton, the rate at which work is done is 1 watt. Watt can also be defined in terms of electromagnetism - electric power is the rate at which electrical work is performed when a current of one ampere flows across an electrical potential difference of one volt. To calculate the relationship between the real, reactive, and apparent power in an AC circuit, check out this power factor calculator. What's the relationship between a watt and e.g. megawatt? Or how much power is 1 Gigawatt? The table below presents the basic SI multiples for watt and their applications. The unit was introduced in the 18th century to compare steam engines with the power of draft horses. Later it was expanded to different types, as new engines and machines were appearing. The most often used units are mechanical and metric horsepowers, equal to ~ 745.7 watts and ~ 735.5 watts respectively. A mechanical horsepower was defined by James Watt to be equal to precisely 33,000 ft lbf/min. Watt found this value by an estimation of horse performance - he observed how many times a horse could turn a mill wheel with a given diameter, then he assumed the force with which the horse pull, and rounded the obtained value to get the final 33,000 ft lbf/min. Thus, horse work rate is about one hp in sustained activity (but it's rather a maximum value, average horse can sustain 2/3 hp for a working day1,2 ), in contrast to a possible peak power of almost 15 hp. For a standard healthy human, these values are equal to about 1.2 hp (0.89 kW) of peak and 0.1 hp of sustained work. Athletes such as e.g. Usain Bolt can produce even 3.5 hp (2.6 kW) for a short time. One metric horsepower is defined as the power needed to raise a mass of 75 kilograms against the Earth's gravitational force over a distance of one meter in one second. Slightly higher value than mechanical horsepower, electrical equivalent equal to exactly 746 watts. It's the horsepower required to move a given volume of air against given pressure, assuming 100% efficiency. It may be used in air conditioning, heating, and ventilating systems. Air horsepower is equal in value to mechanical horsepower and hydraulic horsepower. Boiler horsepower (hp(S), also abbreviated as bhp or BHP) is usually defined as the amount of energy required to produce 34.5 pounds (15.65 kg) of steam per hour at pressure 0 psig (0 bar) and temperature 212°F (100°C). It was used in the USA, Australia, and New Zealand, but the formula differed among these countries. 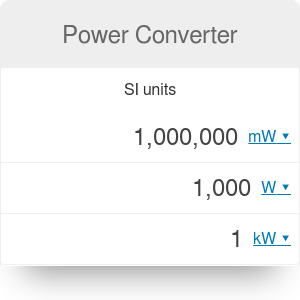 In our power conversion tool, we assumed that 1 boiler horsepower = 9,812.5 W. However, values such as 9810.55407 W, 9809.5 W or 9809 W may be found in some sources. Power Converter can be embedded on your website to enrich the content you wrote and make it easier for your visitors to understand your message.